A couple of weeks back, one of the brightest lights in the literary world went out. No, make that the world. Terry Pratchett, my all-time favourite author, won his fight against the Alzheimer's that was claiming his brain. I say won, not lost. I'll explain further below. 1989, I was eight years old and massively into fantasy such as The Hobbit and The Chronicles of Narnia, even Choose Your Own Adventures. Then, I happened upon this funny looking little book called Truckers, by Terry Pratchett. I can't remember if I received it as a present, or if I picked it up at one of the book sales the school had. All I know is I was intrigued by this cartoon-like cover featuring gnomes (actually, nomes) using everyday objects which are huge to them. There was movement, action and humour, all hallmarks of the book itself as well. These nomes live under the floors of a department store which is their entire world and must formulate an escape plan and brave the mythical realm of the outside when the store is slated for demolition. I was hooked. These nomes were fantastical creatures, but they acted like humans and you could relate to their squabbles and their triumphs. And there was nothing po-faced about it. It was the least "taking itself seriously" fantasy book I'd ever read. I devoured the second and third installments in the series which both came out in 1990 (Terry was one of the most prolific authors ever. He actually released five books in total in that year alone). The third book was the first time I'd ever read a novel in one day. Then I looked to see what else was out there by Terry Pratchett. 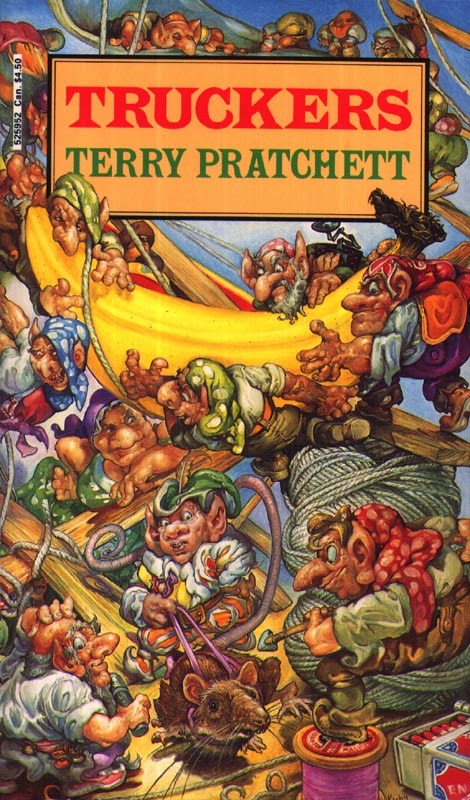 The front of the books said that he had also written the Discworld series, of which there were about ten at that time. Luckily, my mum worked in a bookshop and could get all the paperbacks for me at discount prices. I steamed through them and then read each new installment as it came out. I just had to wait a year after the hardback came out to get the paperback which I would receive for my birthday or Christmas. 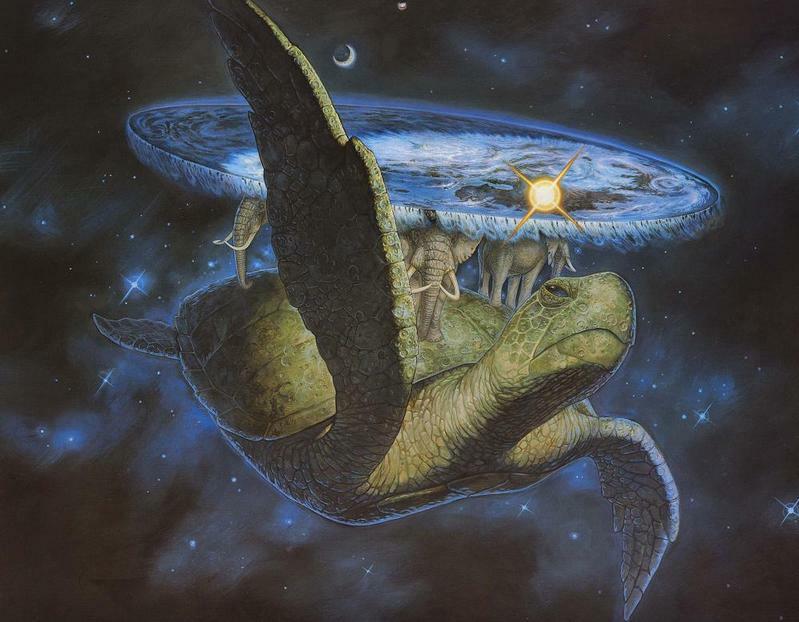 At the time, I couldn't believe everyone wasn't reading Terry Pratchett. On the surface, this was a classical fantasy world complete with dragons, dwarves, trolls, vampires, werewolves, zombies, wizards, witches etc etc. But everything was slightly skewed and subverted. Terry played with the tropes of these creature types and made them fresh. When Death takes a holiday, the undead start appearing in the world and instead of terrorising the living population, campaign for fair treatment with the "Dead Rights Club". Dragons are household pets and there's even a Sunshine Sanctuary for Sick Dragons. Vampires take jobs in the city and wear a white ribbon to show they have pledged to give up human blood. And the characters were like people you'd meet in real life. As the series went on, the scope of the series grew and Terry satirised many aspects of our own world, such as the media, industrialisation, the rise of telecommunications and mass transport, not to mention meaty issues like war, prejudice, religion, sexism and the very nature of existence. But with all that, it never did take itself too seriously. Terry ended up writing over seventy books including his collaborations. Some are better than others, of course, but all carry his unique stamp. During the last few years of his life when his brain was under threat of a disease, he not only continued writing but also became a fierce campaigner and advocate of the "Right to Die", stating that people should have a choice over the manner of their own passing before that choice is taken away from them, and making TV documentaries about possible treatments for Alzheimer's. Terry passed away peacefully at his home, surrounded by his family, at 66 and while on the one hand it's sad that he went at still such a young age, I'm also glad his disease did not get a chance to erode one of the brightest minds on the planet. Here's a link to Terry's Amazon page. If you've never read one of his books before, pick one up and give it a go. Start wherever you like. It's all good. What a wonderful tribute, Nick. There are some writers who really touch you and influence you. I hope Terry knew how many lives his writing touched. That's a great tribute, Nick! I loved his work. At least he left a lot of it, which I can reread. A fantastic tribute, Nick. I have the Truckers and most of Pratchett's books. His quirky tales inspired me greatly. I have not read any of his book, but out of honor to him and the great tribute you wrote about him, I will do so very soon. I'm glad he didn't just fade in a really sad way and died relatively quickly, and while he was still helping the research for a cure ... at least it was peaceful. The only Terry Pratchett book I've read is Good Omens, which he co-wrote with Neil Gaiman. I enjoyed it though, so I'm thinking I should pick up some of his other work! Like Lara, I've only read Good Omens, so I'm not impacted in quite the same way you are, Nick. There's no denying the man's influence. Believe it or not, I haven't read his books. They're on my TBR list, though. I never read one of his books, but several are on my list to be read. I agree with him on the right to die issue. Thanks for sharing your reading experience through his great works. Susan - I'm sure he did, although he always stayed humble and down to earth about it. Diana - He certainly left a lot! Heather - Now is a great time to start! Christine - Glad he inspired you. The Truckers books are great for kids. Betty - You won't regret it! Hilary - He was a great campaigner for a cure and tried everything. A great shame but at least the disease did not get to the worst stage. Lara - Good Omens is such a classic! I haven't read it for over 20 years though, so I must do so again. Jeff - Seems it's a popular book. I'm encouraged by the responses here, because when I wrote about him in the A-Z in 2012, many hadn't heard of him! Misha - You're in for a treat. So much to catch up on! Donna - Thanks. For recommendations - Small Gods, Mort, or The Wee Free Men if you like MG. I heard about this, so it looks like I best start checking out some of his books from the local library in honor of him. This was wonderfully written. I haven't read any of his books, but I plan to. Wow. More than 70 works? That's amazing. Yes, it would be very tough for a writer to get a disease that affects the mind. I'm glad he was able to move on to a better place before it could deteriorate too much.